Every series of a show drops the ball somewhere and it really does seem like this is where series 12 drops the ball. Time Wave as an episode is overall a bit of a mess sadly. The story of the episode sees the team end up on a spaceship where criticism is outlawed, leading to the crew ending up being crap at their jobs and with terrible dress sense but no one able to say anything. Through a number of criticism the team see themselves jailed with a serial tutter only to eventually be taken to be “drained” of their inner critic. 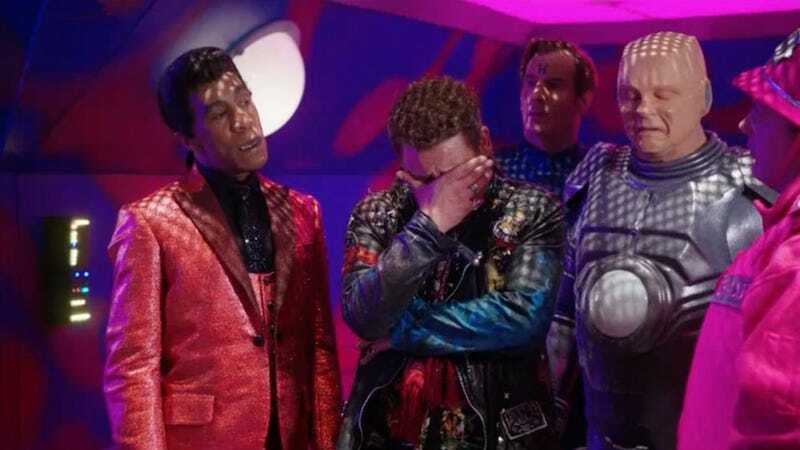 Unfortunately Rimmer overloads the device and instead sees the team criticising the inner critic until he gives up which causes the ship to drop the no criticism rule, at least until the team criticise the captain’s terrible painting. As an overall plot it sadly draws from the now fairly tired “leftie PC safe space” school of saying that it’s the death of society and the ability to criticise people. It’s boring and hackneyed and was overplayed years ago so Red Dwarf is late to the game. Despite this however there are a few notable bright spots in the episode when it comes to some individual gags such as a line referencing the show’s former home of the BBC and the joke surrounding a “serial tutter”, the latter probably being the best part of the episode. Even with these good gags some feel a bit too crude for the show which is a bit of a shame. Johnny Vegas has some serious acting chops despite his dumb man persona, having been lead in the very good black comedy Ideal, and this sadly felt like a waste of his talents in what was a very bizarre sexually repressed “crit cop”. It feels out of place in the rest of the episode and very much plays right into tired clichés. Out of the team however if anyone gets any real spotlight it’s probably Rimmer this week, with the final confrontation being with his inner critic. It’s a reference filled delight as we watch the team blame it for the killing of the Red Dwarf crew at the very start of the show and sees Rimmer get to play a more villainous role once more. Outside of this however very little really happens in the episode sadly. Instead it plays too much towards a tired political snub and as a result sadly lacks when it has anything to put on screen, with the cast forced into a not very good corner when it comes to the material and ends up making the show feel more old and tired than it has at any point since the revival.